Moeraki Game Nr. 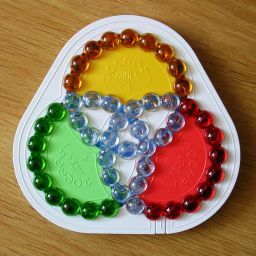 4 is a puzzle with three intersecting circular tracks, each containing 18 coloured beads, which overlap like a Venn diagram. Every pair of tracks intersect at two places, so there are six intersections. All the beads of a circle can move along the track in unison, so the colours can be mixed. In the solved position, the inner parts of the tracks between and including the intersections contain white transparent beads. The three remaining sections of the tracks, the outer part of the circles, each have nine beads of a single colour. Moeraki is the name of a series of puzzle games designed by Kasimir Landowski, all consisting of a number of intersecting tracks containing beads. Game number 3 has also been manufactured physically, the others exist only as software. It is named after large rounded stones that can be found in New Zealand. There are 21 white beads, and 9 beads of each of the three other colours, a total of 48 beads. This gives a total of 48! / (21! 9!3) = 5,084,822,272,975,778,450,832,000 possible positions, which can all be achieved. Casland Games, the website of the manufacturer. Let Y denote the loop that should eventually hold the yellow beads, and similarly R and G the loops that should be red and green respectively. A positive number will be used to denote a clockwise move of a loop by that particular number of beads, and a negative number an anti-clockwise move of a loop. For example, R+1 means a clockwise whift of the red loop by a distance of one bead, and G-5 an anti-clockwise shift of the green loop by a distance of 5 beads. Hold the puzzle such that the Y loop is at the top (R on the bottom right, G on the bottom left). If the Y loop contains one or more yellow beads in a row, then turn Y to bring those beads to the top right, in the yellow section and adjacent to the top right intersection. These beads are now considered to be solved, and in the following steps further yellow beads will be added to it from the bottom until the whole yellow section is solved. If the R loop contains a yellow bead, then turn R until the yellow bead is at the top-right intersection and then do Y-1 to insert the yellow bead into the yellow section. Repeat step c as often as possible. If the G loop contains a yellow bead, then turn G until the yellow bead is in at an intersection with the R loop. Then go back to step c to solve the yellow bead. If the R and G loops do not contain any yellow beads, then the only remaining unsolved yellow beads are in the Y loop but at the wrong location. 1. Turn Y anti-clockwise until there is an unsolved yellow bead at an intersection with the R loop. 3. turn Y clockwise back to where it started. 4. Now go back to step c to solve the yellow bead. There are 5 unsolved bead locations in the Y ring that are not intersections. Lets label them A to E, from left to right. In the next steps, they will all be filled with white beads. If C is not white, then do A+1 B+2, rotate C until the top intersection is white, and do B-2 A-1. If B is not white, then do A+2, rotate C until the left intersection is white, and do A-2. If D is not white, then do A-2, rotate B until the right intersection is white, and do A+2. If A is not white, rotate B or C until the bottom intersection is white, and do C+1 A+1 C-5 A-1. If E is not white, rotate B or C until the bottom intersection is white, and do B-1 A-1 B+5 A+1. The remaining beads can now be solved without turning A at all. If the R loop contains one or more red beads in a row, then turn R to bring those beads to the bottom, in the red section and adjacent to the bottom intersection. These beads are now considered to be solved, and in the following steps further red beads will be added to it from the left until the whole red section is solved. If the G loop contains a red bead, then turn G until the red bead is at the bottom intersection and then do R-1 to insert the red bead into the red section. Repeat step b as often as possible. If the G loop does not contain any red beads, then the only remaining unsolved red beads are in the R loop but at the wrong location. 1. Turn R anti-clockwise until there is an unsolved red bead at an intersection with the G loop. 3. turn R clockwise back to where it started. 4. Now go back to step b to solve the red bead. Consider the bead location in the R loop which lies furthest away from the solved red beads. If this location contains a green bead, then rotate G to bring a white bead to the bottom intersection and do G+5 R+6 G+5 R+9 G+8 R+4. If the G loop contains one or more green beads in a row, then turn G to bring those beads to the left, in the green section. These beads are now considered to be solved, but unlike the previous phases, this time further green beads will be added to this row from either side, whichever is more convenient, until the whole green section is solved. 1. Do G+1 one or more times until the row of solved green beads is adjacent to the top intersection. 2. Do R-1 one or more times until the unsolved green bead lies at the top intersection. 3. Do G-1 to add the bead to the solved row. 4. Do R+1 one or more times until the solved red beads are back where they belong. 1. Do G-1 one or more times until the row of solved green beads is adjacent to the bottom intersection. 2. Do R-1 one or more times until the unsolved green bead lies at the bottom intersection. 3. Do G+1 to add the bead to the solved row. Repeat steps c or d as often as possible. If the R loop does not contain any green beads, then the only remaining unsolved green beads are in the G loop but at the wrong location. 1. Turn G in either direction to bring an unsolved green bead to one of the intersections with the R loop, but make sure that the row of solved green beads does not enter the other intersection. 2. Do R-1 to take the unsolved green bead out of the intersection. 3. Turn G such that the solved green row is adjacent on the left of the intersection where the unsolved green bead was. 4. Do R+1 to add the green bead on to the end of the solved green row. 5. Turn G so that the solved green row is no longer covers the intersection. Repeat step f until the all the green beads are in a row. Turn G so that the green beads are in the green section of the G loop.